You can tell a lot about a hunter's mental state by the body language. The client's hangdog head and slumped shoulders told me all I needed to know. He had blown a chance at a buck. The semi-rough dropping of his rifle into the lodges gun rack indicated that he had actually missed a buck I had to ask. "Any luck out there today?" "Missed a chip shot." And there it was. Over a bourbon after dinner he opened up. He had a precision rifle, topped by a Hubble-like scope with a reticle that could calculate everything from range to bullet drop to wind drift to the rotation of the planet to the deer's age. The cartridges were custom handloads firing polymer-tipped bullets of an insanely high B.C. at the highest possible velocity with the lowest possible Standard Deviation. The chip shot-stretching a football field five times over - was anything but in my humble opinion. But to this gentleman's way of thinking, the money he had sunk into this setup nearly guaranteed backstraps in the freezer and racks on the wall at any range. Technically speaking, everything he had was sufficient for such a shot, but what he had forgotten about was the most critical component: the jerk of the trigger. Or, in this case, the jerk behind the trigger. Joseph von Benedikt's "Open Country" article (below) compares the merits of ranging reticles versus dialing turrets. I was pleased to see that he discussed extensive practice time with either method. This is something all too often shooters neglect. They think that with the right gizmos and technology they can disregard the human element. Long-range shooting and "longer" range hunting is all the rage these days, but too few participants are true students of the sport and instead believe they can buy their way to success. The short answer is: You can't. Yes, you have to buy the right gear to pull off long-range shots consistently, but you also have to practice religiously to make those shots happen. And I don't mean simple bench time. You have to actually practice in field-simulated conditions across the course under a variety of conditionsto become merely proficient - let alone good. If you want to earn the moniker of "rifleman," you need to be as deadly at shooting offhand with iron sights at eight-inch steel plates at 50 to 100 yards as you are lying prone and ringing steel at 1,000 yards. You need to be able to read the wind as it swirls through the canyons and cuts between you and the target. You need to be able to unsling a rifle, drop to a knee, and hit a plate at 250 yards without shooting sticks or a rest. The difference between a rifleman and a guy with an expensive rifle/scope setup is that the rifleman not only can make the shot when a buck pops out of the sage at 75 yards quickly heading for parts unknown, but also can lie down, range, read the wind, and place a bullet in the vitals at 500 yards away—nearly every time. More importantly, a true rifleman knows from experience when a shot presents too many variables to be taken ethically. This could mean a fleeting shot at a running buck at 50 yards to a standing buck at 400 when the wind is gusting 30 mph. Only misses in practice sessions will tell you that you are more likely to miss than to hit when the real shot presents itself. The only way to do this is to undertake real-life practice. Practice all year. 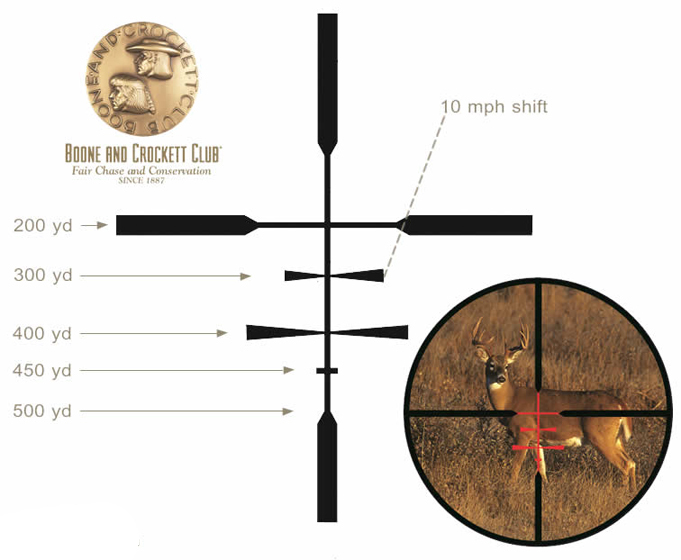 Practice with your own steel targets on vast tracts of public land, focusing on unknown distances and field positions. Utilize your local range, but get off the bench and shoot the basic four positions, even practice doing things that don't directly relate to shooting big game, such as indoor smallbore position competition or Olympic-style running boar with an air rifle. Consider all trigger time good trigger time. If you ignore the practice component and just sight-in your mega rifle, run drop charts, and rely on high-tech mechanical doodads, sooner or later you are likely to slink into a lodge, head hung low, and confess you missed a chip shot! Its the final morning of a 10-day high alpine elk and mule deer hunt in Rocky Mountain wilderness country, and although you shot a nice bull elk in deep timber early on, muley bucks have been scarce. Early sunlight is driving the shadows from the timberline basin, warming your back and lulling you into complacency, when your guide suddenly hisses, "Big buck! Big buck!" Scalding coffee from your Thermos splashes across your legs, and the lid clangs off a nearby rock as you scramble into position behind your rifle, eyes darting around the meadow below "Over there!" your guide whispers. Your eyes follow his pointing finger across the basin and up the far side to where the bucks body gleams in the morning sun like golden wheat. Its farther than the other side of the Mississippi. Dutifully, you raise the premium rangefinding binocular you purchased just for this hunt and hit the range button. The display reads 523 yards, but, overwhelmed by the width and mass of the huge typical bucks antlers, you hardly notice it. Your bullet has a clear path across the wide basin, but you do not. Terrain and time prevent stalking closer. But the buck isliterally five timesfarther than you've ever shot at a deer back in your big-woods home country in the Northeast. In muted fashion your guide is hustling around you, shifting the daypack your rifle rests upon, stuffing a folded jacket under your elbow to stabilize it, and jamming another under the toe of yourstock, giving you a rock-solid rest. Clearly he has done this before, and clearly he expects you to take the shot. Do you? Should you? More to the point: Can you kill the buck cleanly? If you can, you should. Opportunities at big bucks in the Wests wide-open country come dear, and savvy hunters have learned to make the most of them, polishing marksmanship skills and tuning equipment, to enable consistent precision at distances far greater than most whitetail hunters would even consider shooting. Success in such a scenario depends on an accurate rifle; an accurate, high-BC hunting bullet; a scope that enables you to precisely direct your shots at long hunting distances; and skill. To enable long-distance precision, a scope must have either a holdover-type reticle or a dial-for-distance type elevation turret, and were here to discuss and argue the advantages and weaknesses of each. However, lets first define "long hunting distances" because a couple of decades ago 400 yards was a long way to shoot at deer. Many accomplished riflemen of the era routinely dropped bucks by knowing how high to hold the crosswire above the deer's back. Today, there's a better way - and for shots much past 400 yards, its a necessary way. We now have laser rangefinders that can precisely measure distance to a mile or even more. Plus, rifle, ammunition, bullet, and optic makers are providing the most accurate and consistent equipment ever built. For a variety of reasons, I don t hold with extreme-distance game shooting. However, I do believe that 600 yardsisthe new 400. 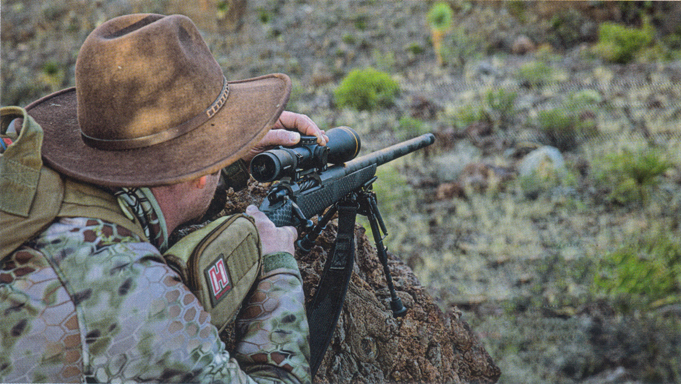 With today's gear, a very good rifleman can consistently hit a vital-size target at 600 yards. Much past that, environmental conditions, game movement, and bullet flight time begin to snowball and predictably making killing shots becomes exponentially more difficult. That's without even considering the evil joker: wind. Holdover reticles help skillful marksmen kiil cleanly as distances stretch. Holdover-type reticles abound in today's scopes. Unfortunately, many of them are rubbish, designed by mathematical whizzes that have never shot a rifle past 100 yards. Among the good reticles, there are two types. One type features increasing gaps between the holdover hash marks on the vertical crosswire. The idea isfor each gap to be wider than the last in order to compensate for a bullet's increasing rate of drop. Of course, the trouble isthat various bullet types drop at much different rates. Within limitations, this type of reticle can be very useful. It's the fastest of all distance-compensating systems, but as distance increases, it becomes less precise. Plus, there's no accurate way to predict and compensate for air density changes caused by dramatic elevation or temperature shifts. Learning how to adjust your magnification ring to "calibrate" this type of reticle to your bullet's ballistic curve is essential. Basically, you sight-in the scope at 200 yards, then change your magnification—which changes the amount of target the gaps between the hash marks span—until the 500-yard hash mark puts bullets on target at that distance. Once determined, mark the magnification adjustment ring with permanent paint and then always use that setting for long shots. The best of this type offer wide, numbered hash marks in a Christmas-tree pattern. The numbers make it easy to find the appropriate yardage line when shooting under stress, and the increasing width in the hash marks helps hold for wind. I've used most of those available, and in my experience three have proven to be the most capable: Nightforces Velocity reticle, Zeiss's Rapid-Z 800 reticle, and Leupold's Boone and Crockett reticle. The second type of holdover reticle features hash marks spaced equally on both crosswires, typically spaced in minutes of angle (MOA) or Milliradian (Mil) gaps. By inputting your particular rifle and load characteristics and the local atmospheric conditions into a ballistic calculator, you can generate a very precise holdover chart. You can also input your local wind speed and direction in relation to your direction of aim, and the calculator will generate hold-off figuresin MOA or Mils, enabling you to use hash marks on the horizontal crosswire to accurately hold off for wind. Also, you can generate updated charts if you change locations to a dramatically different elevation or as temperature shifts as simply as refreshing the atmospheric data in your ballistic app. As a result, this type of holdover reticle is very precise and does not lose precision as distances stretch like the other type of holdover reticle. 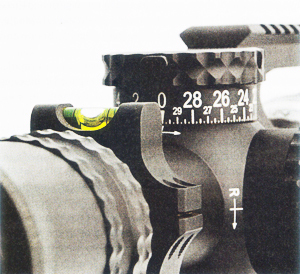 ABOVE : Leupold's Boone and Crockett reticie is simple and capable. Sight-in the primary crosshair at 200 yards and use the hash marks for 300, 400, 450, and 500 yards. However, in addition to being more complex, this type of reticle is a lot slower to use. After your target is ranged, you've gol to dig ouL and reference your chart arid find the appropriate reticle hash mark before you can aim and fire. This type of reticle is much favored by tactical and military-type shooters. In addition to MOA and Mil variations (for American hunters accustomed to thinking in imperial rather than metric measurements, I recommend the MOA system), many scope models come in your choice of first (front) or second (rear) focal plane systems. Reticles in first-focal-plane scopes may be used on any magnification setting; reticles in second-focal-plane scopes must be used on a factory-specified magnification setting to provide accurate hash mark spacing. 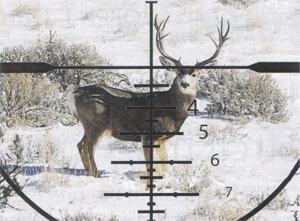 If you don t like counting itty-bitty hash marks and hoisting the primary crosshairs in your scope way above an animal's back before squeezing off a shot, you'll be better served with an elevation turret that you dial up for distance. Dialing for distance with a quality elevation turret is the most precise way to compensate for bullet drop. Capable turret systems today come engraved in either MOA or Mils and have clicks to suit. The best ones have a zero-stop-type mechanism so shooters can dial back to their baseline sight-in distance (typically 100 or 200 yards; being a western guy, I see no sense in sighting in a flat-shooting modern cartridge at anything less than 200 yards) without losing track of how many rotations they made with the turret. You'll input your rifle and load specifics along with your local atmospheric conditions into a ballistic calculator app on your smartphone or tablet and generate a drop chart. Once you've confirmed that it's accurate - or have tweaked it if it isn't - print and laminate the chart. Like MOA - or Mil-based reticles, you can make easy adjustments on the fly by merely inputting updated elevation and temperature data into the ballistic app. Savvy hunters who don't want to mess with drop charts and electronics-dependent ballistic apps have a turret cap engraved to match their rifle and load ballistics. Typically marked in yards, such caps enable the hunter to simply turn the turret to the appropriate yard mark hold on the target and fire. While nothing is quite asfast as a holdover reticle calibrated to match your bullet drop, dialing a yardage-marked turret comes close and offers more precision. Several of today s scope companies offer custom turrets. I've had superb luck with Leupold's CDS (custom dial system) on the company's outstanding 3-18X44mm VX-6 scope. It's the lightest precision scope on the market and features an illuminable reticle with MOA hash marks on the horizontal crosswire to help shooters compensate consistently for wind drift. If your preferred scope company doesn't offer custom turrets, check out Kenton Industries, which offers custom turrets of several types for most of todays quality scope brands. Dial-up turrets have one significant weakness. If you forget to dial back down after taking a long shot, you'll shoot way over your target. I've done it many times - never on game, thank goodness - and most of my turret-equipped buddies have as well. One of the best wilderness hunters I know emptied his rifle's magazine at a massive Wyoming bull elk standing 140 yards away because he'd left his turret cranked way up. And, no, he didn't figure it out in time to correct and put elk steaks in his freezer. Setting up a shooting system - which I define as rifle, ammo, and optic - for precision work at increased distances comes with a standard-issue temptation: Just how far can I ethically kill an animal? Limiting yourself to taking only ethical shots is up to you, and as a hunter with a healthy respect for our sport and for the game you hunt, it's your obligation to do so. Obviously, in order to limit yourself to ethical ranges you've got to know where your ability in the field maxes out. I use a challenging and fun drill to determine my maximum ethical range. It'll take time and plenty of ammo, so come prepared. First, you need a place to shoot long. If need be, save your beer money for a couple of months and make the drive to a place where you can shoot to 600 yards. Ideally, it'll be someplace where you can place your own target and move about freely. Put up a steel plate that measures eight to 10 inches. You can get them from Caldwell and other target suppliers. Yes, that's a bit smaller than a big deer's vitals, but you'll be practicing without massive doses of adrenaline bulging your veins and without fatigue and cold weather stiffening and coarsening your motor skills. Begin backing away from the plate in 100-yard intervals. At each interval,shoot three shots prone (ideally with a quality bipod, lightweight rear beanbag, and good technique), then three shots sitting, followed by three standing. Shoot slowly and let your rifle cool when the barrel becomes too hot to grip in your hand. As the distance increases, dial up your turret or hold over with your reticle, and shoot with particular care. One should never take a rushed long-distance shot on game, so don't rush now. You'll soon begin to miss the offhand shots and then the shots from the sitting position. When you can no longer keep all three on the plate from a given position, mark the distance and the shooting position in a notebook and discard that position during farther distance work. If you want, switch to 50-yard intervals to further refine your maximum ethical distance. Personally, I'm not much good past 100 yards when shooting offhand, and I begin to miss around 250 yards from the sitting position. There are shooters who can better that, but it tells me that to shoot long I've got to be either prone or resting over a rock or stump to be effective. From the prone position I can ring an eight-inch gong pretty consistently out to 600 yards - provided I'm shooting a super-accurate rifle with a very good load and that I have my holdover reticle or dial-up turret ironed out. If you can, practice this drill frequently. Youll be amazed and delighted at how quickly your maximum ethical distance increases. Practice in various wind conditions, because wind dramatically curtails your effective range. Most importantly, accept whatever the distance is where you begin to miss as a concrete limitation while hunting. Push your limits during practice. Work to increase your effectiveness.But while in the field, maintain your respect for the game and abide your limitations.